Frank G. Gmuca, son of Mr. and Mrs. Andrew Gmuca of 120 Sheridan St., graduated last week from the Harlingen gunnery school, Tex., as an aerial gunner in the Army Air Forces. He was awarded his silver wings at brief exercises at the school and upon completion of another technical course will be automatically advanced to the grade of sergeant. Unless retained as an instructor then, he will join a combat unit. Pvt. James R. Williams, 20, son of Mr. and Mrs. Ross Williams of Tire Hill, is detailed to duty with a tank division of the Armored Force at Ft. Knox, Ky. Prior to his induction into the Army last November, he was employed by the Bonnell Service Station, Tire Hill. Aviation Cadet Paul Harclerode, son of Mr. and Mrs. J. E. Harclerode of Ebensburg, was commissioned a second lieutenant on Monday at the American Air Force technical training command school at Yale University. Lt. Harclerode is a graduate of Ebensburg-Cambria High School and Ohio University College of Applied Science. He entered the service on Sept. 4, 1942, and was stationed at Chanute Field, Ill., prior to entering the Air Forces school at Yale. Sgts. Francis J. Timchak, son of Mr. and Mrs. Stephen Timchak of 192 D St., and Charles E. Harbaugh, son of Mr. and Mrs. Charles V. Harbaugh of 70 duPont Pl., graduated recently from the Army Air Forces gunnery school at Kingman, Ariz. Timchak entered the armed forces Aug. 15, 1942, and Harbaugh has been in service since Nov. 10, 1942. Sgt. Warren A. Kipp and Pvt. James G. Kipp Jr., son of Mr. and Mrs. James G. Kipp of Cairnbrook, are serving in the U. S. Army. Sgt. Warren entered the Army Air Forces at Miami Beach, Fla., on Aug. 15, 1942, and graduated from radio school at Sioux Falls, S. D. At Harlingen Gunnery School he was made sergeant and received his silver gunnery wings. He now is stationed at a replacement center in Salt Lake City, Utah. Pvt. James Kipp Jr. entered the Army Air Forces on Mar. 30 of this year and now is stationed at Miami Beach, Fla. Both are graduates of Shade Twp. High School, Cairnbrook, and are grandsons of William Kipp, 752 North Center Ave., Somerset, and Albert Blough of Moxham. Charles W. Ondrejack, son of Jacob Ondrejack of B St., has been advanced to the rank of sergeant, relatives were informed. He is stationed with the U. S. Army Air Forces at Maxton, N. C.
Emil J. Vavrek, former Johnstown Catholic High School football player, has been promoted to the assignment to the Army Air Forces technical school at Sioux Falls, S. D. He is a son of John Vavrek of 511 Plum St. Before enlisting last Dec. 15, Pfc. Vavrek was engaged in airplane radio installation at the air deport at Middletown, Pa. He received basic training at Miami Beach, Fla.
Cpl. Joseph E. Brown has returned to Army duty after spending a 10-day furlough with his parents, Mr. and Mrs. Martin Brown of St. Michael. Now stationed at Camp Chaffee, Ark., Cpl. Brown was inducted into the Army on Dec. 3. He is a graduate of Adams Twp. High School and was formerly employed by the Berwind-White Coal Company at St. Michael. Pfc. Frank R. Verhovsek, son of Mr. and Mrs. Frank Verhovsek of Johnstown R. D. 3, is now serving with the U. S. Marine Corps in the Southwest Pacific. Formerly employed in the upper shops of the Johnstown Lorain Works of Carnegie-Illinois Steel Corporation. Pfc. Verhovsek enlisted in the Marine Corps on Aug. 3, 1942, and received training at Parris* Island, S. C., and New River, N. C. In December, 1942, he was transferred to Camp Dunlop, Cal., and was stationed with the Fleet Marine Force at San Diego prior to going overseas. During his training period, the local marine earned medals for sharpshooting with the pistol and rifle and also qualified as an expert with the bayonet. Aviation Cadet Thomas Womer, son of Mr. and Mrs. John Womer of 319 Third St., Conemaugh, has completed approximately one-third of his pilot training in an Army Air Forces training detachment at Fletcher Field, Clarksdale, Miss. He will report soon to one of the southeast basic flying schools for the next phase of his flight training, in which he will learn to handle faster and more powerful planes. On completion of his basic course, he will be assigned to an advaced school for the final phase of training. Staff Sgt. Walter G. Shank, son of Mr. and Mrs. Ernest Shank of 340 Cooper Ave., returned to duty at Camp Polk, La., recently after having spent a 14-day furlough with his parents and friends. The *soldier* received his basic military instruction at Camp Lee, Va., and has been stationed for the last 10 months at Camp Polk, where he is serving with a medical unit in an armored division. A graduate of Johnstown High School, class of '34, Sgt. Shank was an employe of the Bethlehem Steel Company here before he entered the service. John Przywara, petty officer third class, U. S. Navy, spent a 10-day furlough recently at the home of his mother, Mrs. C.Przywara, Eleventh St., Windber. John graduated from Windber High School in 1940 and was employed by the American Stores Company as a sign painter until May 1, 1942, when he enlisted in the Navy. He received his basic training at Newport, R. I., and has been on sea duty since last July. During his furlough John visited his brother, Seaman Alexander J. Przywara, who is now stationed at the U. S. Naval Training Station, Great Lakes, Ill.
Cpl. John L. Kralik, Staff Sgt. Frank J. Kralik and Pvt. George A. Kralik, sons of Mr. and Mrs. John Kralik of 310 Wall St., are stationed at Army centers in widely - separated sections of the country. Cpl. Kralik, first of the brothers to enter military service, was inducted last July 17 and assigned to the air forces. He took basic training at New Orleans, La. ; served at March Field, Cal. ; attended gunnery school at Las Vegas, Nev., and now is at Muroc, Cal. Sgt. Kralik was induced Nov. 24 and is in the quartermaster corps. He trained at Camp Lee, Va., and Ft. Hamilton, N. Y., before being transferred to his present station at Indiantown Gap, Pa. Pvt. Kralik, inducted Feb. 22, is with the infantry at Camp Gordon, Ga. He was given basic training at Camp Blanding, Fla. John Kralik formerly was emplyed by the Bethlehem Steel Company, Frank by the McCrory Store and George by Lower Yoder Twp. Pvt. Benny F. Tarbay, formerly of Morrellville, is serving with the U. S. armed forces in North Africa. Pvt. Tarbay enlisted in the Army on Oct. 3, 1942, and received his basic training at Ft. Eustis, Va., being assigned later to an Army electrical school in Chicago, to Camp Stewart, Ga., and to Camp Kilmer, N. J., for additional instruction. Before his enlistment the soldier was an employe of the Johnstown Plant of the Bethlehem Steel Company. His wife, the former Betty Mae Howard, is making her home with her parents at 552 Vickroy Ave.
Pvt. Paul T. Just, serving in the Medical Corps, who was recently transferred to Mitchel Field, Long Island, N. Y., recently was home on furlough to visit with his wife, the former Miss Agnes Stein, 141 Feeder St. Pvt. Just was inducted into the Army on Feb. 24. He formerly was emplyed as a craneman in the Johnstown Plant, Bethlehem Steel Company. Pfc. William (Bud) Flook, son of Mr. and Mrs. George Flook of Pershing Ave., Franklin Bor., hase [sic] been promoted to the grade of corporal at Ft. Devens, Mass. He was inducted into the Army on Sept. 10, 1943, and recieved his basic military training at Camp Picketty, Va. Before entering the service the soldier was an employe of the Bethlehem Steel Company here. Cpl. Fook recently spent a 15-day furlough with his parents and his wife, the former Miss Betty Utzler. Cpl. and Mrs. Flook are the parents of a son, Billy. Pvt. Walter Glenn Angus, son of Mr. and Mrs. Howard D. Angus of Conemaugh R. D. 1, has been assigned to Camp Davis, N. C., for his basic training. He attended Conemaugh High School and was employed in the car shops of Bethlehem Steel Company here at the time of his induction, Mar. 22, 1943. The soldier's wife, the former Miss Irene Marsh, is making her home with her parents at 631 Napoleon St.
ASHVILLE – Mrs. Pearl (Crawford) Risban, 52, wife of Joseph Risban of Ashville, died yesterday morning in Altoona Hospital. A daughter of Robert and Alice (DeHaven) Crawford, she was born in Du Bois on Feb. 19, 1891. Surviving are her mother, who resides in Gallitzin; her husband, and seven children: Pvt. Alfred Domzella, stationed in California; Cpl. William Risban, stationed in Mississippi; Merle, Johnstown; Mary, Pittsburgh, and Margie, Gerald and Ruth, all at home. She also leaves six stepchildren – Gilbert, Colorado; Bernard, at home; Clete, California; Clem, Homewood; Mrs. Walter Pringle, Delaware, and Pvt. Wilmer Risban, stationed in Mississippi. Mrs. Risban was a sister of John Crawford, Cleveland, O.; Mrs. E. H. Shultz, Altoona; Mrs. Harry Olnhausen, Pittsburgh; Mrs. R. E. Howell, Gallitzin, and Mrs. John Begandy, Rochester, N.Y.
Funeral arrangements, under the direction of Walter A. Gibbons, Ashville mortician, are incomplete. 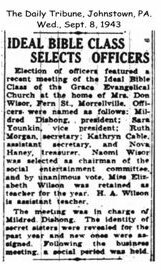 Election of officers featured a recent meeting of the Ideal bible Class of the Grace Evangelical Church at the home of Mrs. Don Wisor, Fern St., Morrellville. Officers were named as follows: Mildred Dishong, president; Sara Younkin, vice president; Ruth Morgan, secretary; Kathryn Cable, assistant secretary, and Nova Haney, treasurer. Naomi Wisor was selected as chairman of the social entertainment committee and by unanimous vote, Miss Elizabeth Wilson was retained as teacher for the year. H. A. Wilson is assistant teacher. The meeting was in charge of Mildred Dishong. The identity of secret sisters were revealed for the past year and new ones were assigned. Following the business meeting, a social period was held. The marriage of Miss Helen E. Coulter, daughter of Mrs. Floyd Mintmier of Cover Hill, to William Ray Keller of Dale, was performed at 7:30 p.m. Saturday. Rev. S. V. Carmany officiated at the double-ring ceremony by candlelight at the First Evangelical Church. Mrs. Wade Bash served as matron of honor and Charles Keller was his brother's best man. Following the ceremony a reception took place at the Mintmier home. The younng couple then left on a wedding trip to Cleveland, O. When they return they will live at the Mintmier home. Dr. William Pringle, 87, of 972 Franklin St., who practiced medicine here for 48 years before retiring seven years ago, died at 8:40 o'clock last night at Memorial Hospital, where he had been a medical patient since Sept. 2. The well-known physician, who formerly had offices on Locust St. for many years, administered to victims of the Johnstown Flood of 1889 and during his long career in the medical field was in attendance at the births of hundreds of local residents. Born at Wilmore on Sept. 12, 1856, Dr. Pringle was a son of A. B. and Sarah (Barnett) Pringle. He was a druggist for a time at South Fork and in 1888 graduated from West Penn Hospital and was licensed to practice medicine. Dr. Pringle first opened offices in Conemaugh and after practicing there for a short time located in a downtown building. He moved his offices to 965 Franklin St., Eighth Ward, several years before retiring shortly after the flood of 1936, when his office was damaged by the flood waters. About five years ago, Dr. Pringle received a certificate from the State Department of Health in commemoration of 50 years in the practice of medicine. Since the death of his only son, J. Earl Pringle, three years ago, Dr. Pringle had been residing with the grandson, Clarence Pringle, at 972 Franklin St. His wife, the former Mazie Krider, died shortly after the Flood of 1889. Surviving are three brothers - E. E. Pringle, Conemaugh; C. W. Pringle, Wilkinsburg, and Dr. A. A. Pringle, Excelsior Springs, Mo. Also surviving are three grandchildren and two great-grandchildren. Private funeral services will be conducted at 2 o'clock Saturday afternoon at the Carl Davis Funeral Home, Conemaugh, by Rev. E. E. Ormston, pastor of the Conemaugh United Brethren Church. Interment will be in Grandview Cemetery. Ebensburg - Funeral services for Geoffrey White, who died Monday, will be conducted at 2 o'clock Friday afternoon at the White home in Cambria Twp. by Rev. J. Leo Ferguson, pastor of the Ebensburg Christian Church. Interment will be in Bethel Cemetery under direction of the Askew Funeral home. Funeral services for Harvey "Dad" Bretz, 69, of 535 Harold Ave., who died Oct. 9, were conducted last week at the home of Rev. W. M. Peffer of the Grace Evangelical Church, assisted by Rev. Robert R. Doverspike of the Garfield St. Evangelical Church. Burial was in Grandview Cemetery where ritualistic services of the Brotherhood of Railroad Trainmen were read by J. B. Hileman, secretary of the Conemaugh & Black Lick Railroad Brotherhood. Pallbearers were Oscar Zane, William McKendree, Ray Horner, Donald Fritz, Joseph Miler and Robert Varner, members of the brotherhood. Out-of-town residents in attendance included Mrs. Bertha Gilbert of Carlisle, Mrs. Anna Beck and Mrs. Carrie Crozier, Harrisburg, and Mrs. Viola Curley, Philadelphia, sisters of the deceased; Mrs. Harry Diehl, Carlisle, a niece; Clarence Beck, Harrisburg, a nephew, and Mrs. Fred Everhart, Hillsdale, Mich., and Bruce Hite, Bloomsburg. -- It is estimated that the per capita consumption of milk in the U.S. last year was 177.26 quarts. Butler -- Blond, blue-eyed Wayne Shoemaker, three, was found safe and well a mile from his today after being missing for 20 hours. Soon after an employe [sic] at the American Rolling Mill scrapyard found the child sitting on the steps of a crame fire airena were sounded to recall more than 1,200 volunteers searching for him. The child was wet and cold, but otherwise apparently non-the-worse for his experience, police said. Grass fires were extinguished by city firemen yesterday afternoon on the hillside near the upper end of the Ebensburg Rd. and in St. Mary's Greek Catholic Cemetery in Lower Yoder Twp. Boswell -- The Ladies Altar Society of St. Joseph's Catholic Church will serve a spaghetti supper this evening in the church hall. Mr. and Mrs. Charles F. Custer of 209 Market St. celebrated the 50th anniversary of their marriage on Sunday. The couple were guests at a family dinner at 6 p.m. at the Sunnehanna Country Club; and duing the evening were entertained at open house at the home of their daughter, Mrs. Francis M. Conrad, 1345 Kemmer St., Sunnygrove. Mr. Custer, a native of Bedford County, and the former Ida May Briney of Johnstown were united in marriage in Cumberland, Md., on Oct. 31, 1893. They made their home in Johnstown for a number of years following their marriage, then moved to Pittsburgh, where they resided for about 30 years before returning to Johnstown about two years ago. The couple are parents of three children -- Mrs. Conrad, mentioned above; Edward M. Custer of Pittsburgh and Mrs. Reginald M. Jocyian of Frexel Hill, Pa. They have four grandchildren. Cresson. -- Clarence Kimlin, 57, of Cresson died at 23:30 o'clock this morning in Mercy Hospital, Johnstown, where he had been a patient since Sunday. funeral arrangements are in charge of H. F. Conrad & Bro., local morticians. Meyersdale. -- Funeral services for Mrs. Agnes Reisinger, who died on Saturday morning, were conducted this morning in SS. Philip and James Catholic Church by Rev. Father Thomas J. Houghton. Interment was in the church cemetery. Gene Robert Nees, three-year-old son of Sgt. Paul and Mary Belle (Smith) Ness of rear 736 Bedford St., died yesterday of pneumonia and scarlet fever at the Polk State Hospital near Franklin, Pa., where he had been a patient for four months. Surviving in addition to the parents are two brothers, Paul and Wesley, both at home. The father is stationed with the Army at Sheppard Field, Tex. Private funeral services were held at 3:30 o'clock this afternoon at the Geisel Funeral Home. Interment was in Richland Cemetery. CLYMER -- Announcement has been made here of the wedding of Miss Clorice V. Shortt, daughter of Mr. and Mrs. Oran E. Shortt of LaGrange, Ga., and Sgt. Kenneth Shank, son of Mr. and Mrs. John R. Shank of Clymer. The ceremony was performed on Oct. 31 in LaGrange, Ga., by Rev. J. Forrest Johnston. Sgt. Shank is stationed at Camp Shelby, Miss.